Fifty years in the life of a club is an occasion to savour. Exiles Sports Club, one of six premier league waterpolo clubs in Malta, are proud to have reached such a landmark this year and will be celebrating this milestone in the most appropriate manner during 2017. 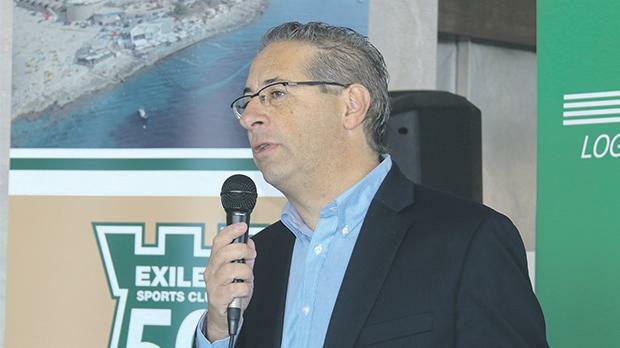 While recalling the early years when the founder members headed by the late Mr Justice Gino Camilleri started Exiles’ ball rolling, club president Andrew Paris gave details in a press conference held at The Exiles Panorama Lounge of the activities which are envisaged throughout the year with a series of social, sporting and philanthropic events under a special 50th anniversary logo commissioned by the committee. “This is intended to give significance to the position Exiles holds in its community, its sporting impact and its location as a socially safe place for families to interact,” he said. “With the philantropic concept in mind, the club has selected St Patrick’s School and the Ursuline Sisters, two institutions which provide education and shelter and situated in the heart of Sliema, to be the partial beneficiaries of any profits generated from these activities. On the waterpolo front, Paris said: “The club is intent on revamping its senior team. Coach Dorian Pisani and his assistant Matthew Pisani will have a blend of youth and experience, with this year’s additions including Michele Stellini, Benji Lanzon, Sean Xerri de Caro, Matthew Castillo (all from Neptunes) and the return of Timmy Sullivan from Sliema. The club president confirmed that for the second consecutive year and the fourth overall the senior team will again be sponsored by the local freight and logistics company, Jetfreight, on behalf of which managing Director Olvin Galea presented the club with the sponsorship funds. During the press conference a video was shown featuring the players’ training sessions and clips including interviews with the Exiles Under 17 players selected to participate in a programme commissioned by Olympic TV last year. Club statistician William Montanaro gave details of the club’s honours won since 1967. These include ten leagues and as many knock-outs, including four doubles, all in the second division, and a ladies knock-out in 2015.